The second round of Arcadia Valley Romance novels has started! 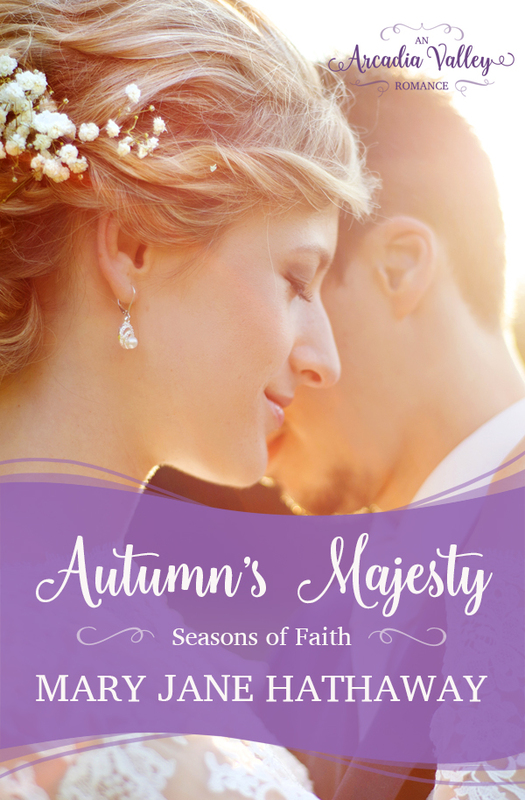 Mary Jane Hathaway’s novel Autumn’s Majesty released on Tuesday, continuing the saga of the Delis brothers. Who doesn’t love a Greek wedding? Especially if they’re folks you know and love, like Nico Delis and Charlotte MacGregor from Spring’s Blessing, Mary Jane’s introductory novella in Romance Grows in Arcadia Valley (which, by the way, is FREE everywhere right now!). Yep, that’s how Autumn’s Majesty begins! You’ll also see newlyweds Violet and Silas (from Summer’s Glory, released in February) and catch glimpses of quite a few other Arcadia Valley residents you’ve met in our other authors’ novels, too. But now it’s Theo Delis’s turn to find love. He’s had a secret — or so he thought! — crush on fellow teacher Jamie Lawson for a long time, but he’s so quiet and she’s so… NOT, that he doesn’t know what to do about it. Helping out her ailing father by managing the family blueberry farm between school years seems like a good chance to get to know Jamie better. But, of course, it’s not that easy, because what kind of romance novel would that be? Can the town busybody learn to keep a secret? Vivacious Jamie Lawson has a lot in common with her first grade students. She’s bright, curious, energetic, has a big heart… and lacks any kind of filter. Her friends laugh about how she can’t help sharing what’s on her mind, but her mother warns her that trouble will find a woman who can’t hold her tongue. The day Jamie accidentally breaks her best friend’s trust, she finally realizes that what is charming in a six year old, just isn’t as adorable in an adult. She vows that with God’s help, she’s going to listen more and talk less, especially around handsome Theo Delis. He’ll be helping her run the Lawson Family Blueberry Farm for the summer, and it will be the perfect time for Jamie to learn a little introspection. His serious, no-nonsense demeanor is the polar opposite of her gabby personality, and she’s sure he’ll be drawn to her new, aloof personality. But as the heat of an Arcadia Valley summer settles in, Jamie discovers there’s more to wisdom than silence and more to love than mystery. When an old friend needs confidential support can Jamie finally learn to lead with her heart, and not her mouth? She looked up at him, confusion in her eyes. They were such a clear gray, like a cloudy sky in winter time. Even red-rimmed, they were stunning. He could look into those eyes for days and never tire of them. “Your farm. Blueberries. Almost ready for picking.” He had the distinct feeling he was speaking the wrong language. “Help out?” She wasn’t looking any happier. Her brows lowered over those gray eyes, which looked stormier than a few minutes ago. “Crete.” It wasn’t a question. She was simply repeating him, as if unable to grasp his meaning. Autumn’s Majesty just released! You can pick it up on Kindle, Kobo, Nook, iBooks, or coming soon in paperback!